The Scott Flex 753-4 is a small stream fly rod, ideal for creeks, beaver ponds and backcountry fishing. FX 753-4: We were concerned that the shortest rod in the series would feel too stiff for its line weight, but it does not. The Flex 753-4 has an appropriate action and casting range for a creek rod. It loads naturally and easily from 10 feet to 40 feet. While capable of casting much further, it begins to lose accuracy beyond that distance. While the basic action of this rod is appealing, it bounces more than the higher line weight models. This rod casts well in close and fizzled out past the 35 to 40 foot range. A little off the tip in close but accurate and not bouncy until you had more line out than you should. This would be a fine rod for someone’s first creeking stick. I tend to be a little scrutinizing regarding 3 weights, but its because I own a Scott F2 653. 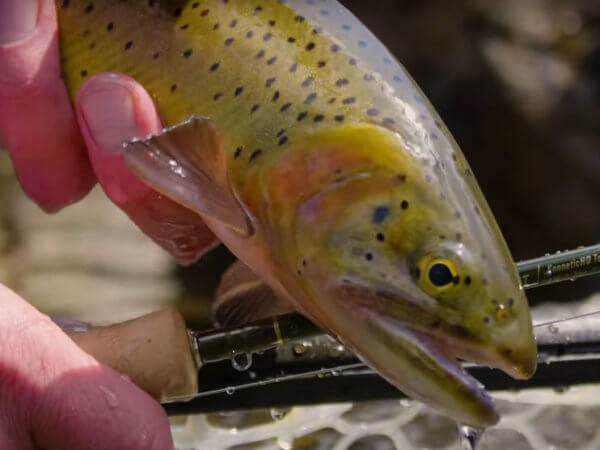 That glass rod is a tough act to follow but if you’re in the market for a sub $500 made in the USA creeking rod, give this little guy a look.